The Endurance 720 has plentiful living space for opulent long term cruising. 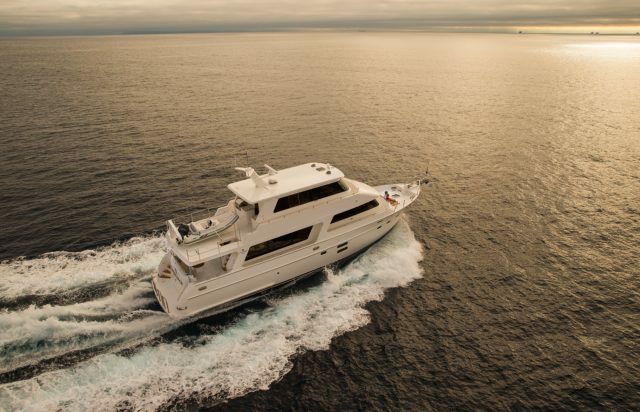 With its richly appointed skylounge with an additional day head, 3 large staterooms with ensuite heads, and full crew quarters, the Endurance 720 is built for entertaining. Table - Teak wood with a compass rose inlay design. (No warranty on exterior wood tables). Custom table with 8 x dining chairs port side. $ 50,000.00 allowance to cover the purchase cost of all furnishings, soft-goods (bedding, towels, carpeting, etcetera), dinnerware and installation costs. $50,000 allowance: Electronics - Garmin 7600 series - radar, chart plotter, touch screen monitors x 5, autopilot, Dpt/Speed/Temp, GPS, VHF radio x 2, AIS & Magnetic Compass. Note: the customer can choose the brand of eletronics, the total allowance is $50,000.00. "Taking the helm of the 720 Endurance is commanding to say the least. You really feel like you're at the helm of a ship. You feel like you're in a boat twice its size. You feel like you're in a boat twice its weight. As the name suggests, Endurance, it has the seakeeping ability and confidence to go anywhere. This boat is serious in construction, form, and function. Stepping inside the Endurance is like a home away from home." Created by Leigh-Smith Yachts in Sanctuary Cove, Australia. "I was really impressed with the handling and ease of docking the vessel in tight spots and the exceptional visibility around the boat. The four extra control stations make life fun when operating around the dock. Engine room was spacious enough for a 6 foot 2 inch Gorilla like me to get around both engines. I can go on and on about this boat. Your team has put a lot of thought into this product and I just want to say I love the boat." 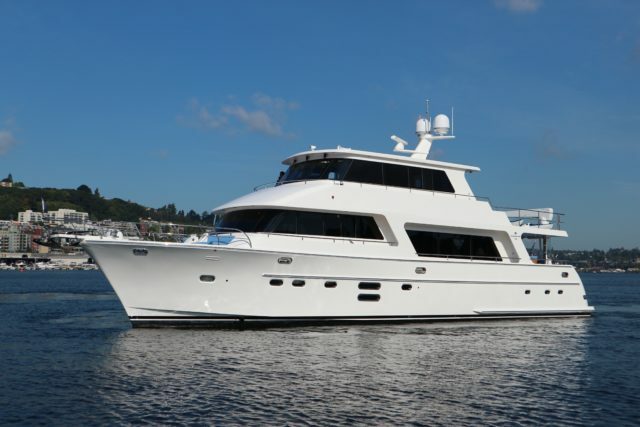 “My first experience was the purchase of a new Hampton 620 motor yacht. Skip Smith, my sales specialist, worked tirelessly providing me information on the 620 and making me feel comfortable switching over to the Hampton brand. 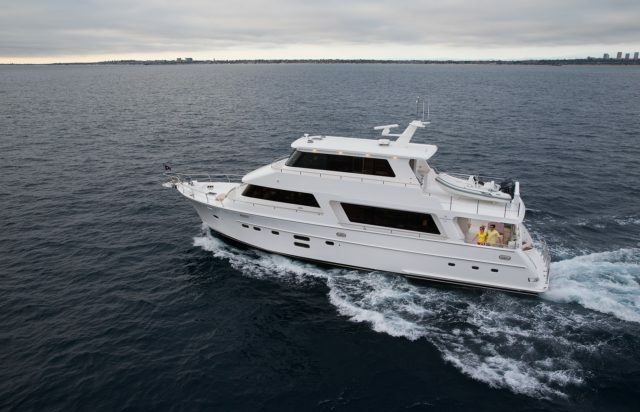 In fact, we loved the 620 so much, two years later we purchased a new Hampton Endurance 720. Anyone who comes aboard remarks on how well the boat is made…..The attention to detail, the fit and finish, and the redundancy of the onboard systems are second to none. Service is so critical to any operation and once again Hampton has exceeded my expectations. Theo, who’s in charge of the service department, is a genius when it comes to working on Hampton boats. There is nothing he hasn’t seen and nothing he can’t fix. I have had a need to call him after hours at times and he is always there to help. He truly cares about the people and making sure the Hampton experience is one of excellence. Owner Steve Seher shares what he loves about his Endurance 720 - "We wanted a big enough boat that we could drive ourselves, but later on to have crew quarters underneath. This boat does all of that for us. We have our grandchildren now who can ride with us, and later one when they're gone, we can put crew downstairs and go wherever we want to go." The 2015 Newport Beach Boat Show was being rained out, and only a couple of other hearty souls were on the docks. We were there to look at a 60-foot vessel only to find it deserted. As we turned to leave the area a voice rang out, “Over here, get out of the rain” and thus began our relationship with Hampton Yacht Group and Chris Elliott. Their “office" that day was a beautiful 72-foot Endurance by Hampton Yachts. After some warm conversation and hot coffee we left the very approachable yacht brokers, awed by the vessel we had been introduced to, but feeling it was too big for us, as this would be our first yacht. For the next few weeks I researched various boat builders, comparing the specifications of the craft they produce and Hampton-built yachts came out on top in all of the categories that were important to us. However, we were still looking for a smaller vessel and decided to go to the San Diego Boat Show which had just opened. 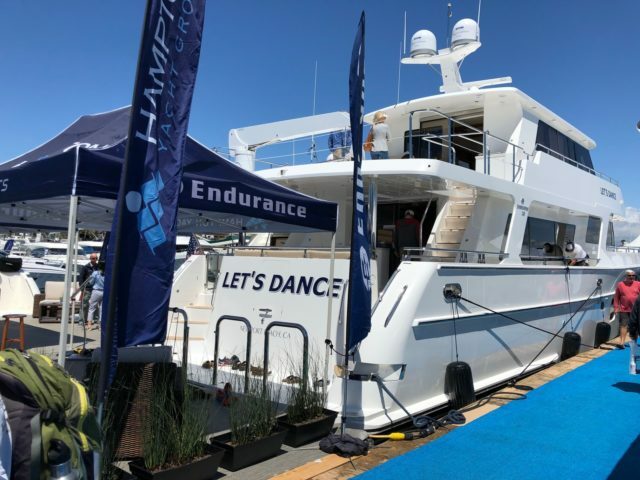 Once there, we went aboard several yachts in the 60-foot range but we kept comparing their features to that of the beautiful Endurance 720 last seen at the Newport Beach show two months earlier. As we started down another dock we had no idea we were about to become yacht owners that day. But, there she was, the Endurance 720, sitting majestically in a slip with the same friendly brokers waving us on. That day we bought her. Now, a couple of years later, we are even more convinced that we made the right decision. With enormous space in the interior we are never cluttered. The fully equipped galley is a dream - on long cruises it is easy to cook a full meal. 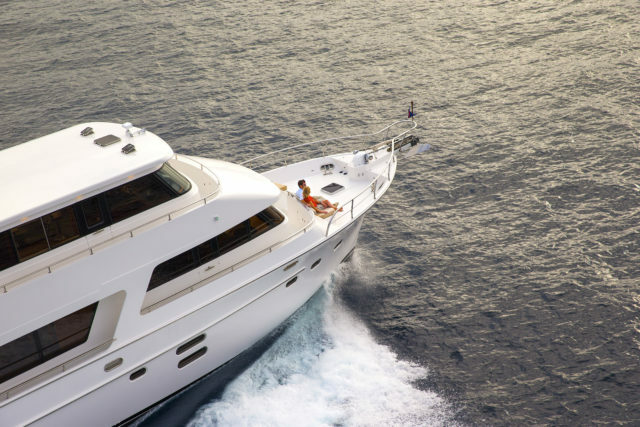 Stabilizers make for a smooth ride and first-class equipment installed by the Hampton ship builders coupled with the service and after the sale policies of the Newport Beach office has made our cruising experience trouble-free. "Any boatbuilder worth his salt knows that success lies in the fundamentals of design and construction. Falter there and no amount of backfilling will save the day. But dial in all the critical points and a promising foundation can be laid. Hampton Yachts nails the fundamentals with this addition to its proven Endurance Series, the 720 EN." "Few boats display as much practicality as the Hampton Hampton Endurance 720 Skylounge. It’s been designed with a great deal of thought, the seasoned owner of this boat contributing his knowledge, combining with the workmanship of the Hampton yard and the continued development by the team from Leigh-Smith Cruiser Sales, resulting in a very liveable and workable craft." Request a hard copy by mail.